Summary: Now that the alarmists have had their day trumpeting the IPCC’s worst case scenario (it’s unlikely and becoming more so), let’s look at their best case scenario (hidden by journalists). The risk probabilities are asymmetric: the good news is more likely than the bad news. This is inspirational, telling people that we can make a better world. The IPCC’s AR5 used four scenarios to discuss the future of climate change. These Representative Concentration Pathways (RCPs) describe trends for future emissions, concentrations, and land-use, ending with radiative forcing levels of 2.6, 4.5, 6.0, and 8.5 W/m2 by 2100. The worst case is RCP8.5. It assumes ugly changes in long-standing trends of population growth and technological development. It is unlikely, and becoming more so each year. But it allows climate activists and click-hungry journalists to spin useful nightmares to terrify the public. The middle two scenarios seem likely, RCP4.5 and RCP6.0. Both would have ill effects on the world, adding to the stress from increase in pollution and population growth. Neither are Armageddon (combined with our other problems, RCP8.5 might be close to Armageddon). RCP2.6 is the ignored orphan. It provides no sad stories for journalists and no propaganda for activists. In a sane world it would be headline news, showing us a feasible future achievable — with some work. But not like the revolution activists advocate. See the best guide to this path to a better world. “RCP2.6: exploring the possibility to keep global mean temperature increase below 2°C.” by Detlef P. van Vuuren et al. in Climatic Change, November 2011. This paper is too complex to summarize here. Let’s look at the key points about this vision of the future, and how it is already happening. One way to get to negative emissions by the 2020s. by Andy Wiltshire of the UK Met Office. A decline in the use of fossil fuels after 2020 contributes most to reduced emissions, along with a shift to biofuels and carbon-capture systems. How can that be done? In the below graph, Detlef P. van Vuuren et al. shows one path to negative emissions while energy consumption continues to grow. Like most of these projections, they assume a century of tech stagnation — so that coal becomes the fuel of the future. CCS is carbon capture and storage. There are no signs whatsoever of this happening. Primary energy use per year (in EJ), by source. Explaining one of the good paths to the future. Detlef P. van Vuuren et al. explains one path, relying on strong government policies. Low assumptions for technological progress is a prudent conservatism in the construction of the RCPs, but that is seldom mentioned by the fear-mongers that dominate the news media. “Both the IMAGE calculations and the current literature suggest that there are a number of key conditions that need to be met in order to achieve the required level of emission reductions. From The Economist. Click to enlarge. There are two keys to achieving RCP2.6 without massive government policy action. First, replacing coal as a primary source for electric generation. Second, replacing petroleum liquid fuels as a primary source for cars. The first is already happening. Renewable energy sources (e.g., solar, wind, geothermal) are slowly becoming able to provide substantial grid power. For example, see the graph on the right showing Swanson’s Law in action, the relationship of solar cell costs to volume. For the near future, substitution of natural gas for coal will make the most difference. Burning coal to produce a million BTUs of energy produces an average of 210 pounds of CO2; burning natural gas to do so produces 117 pounds of CO2 (see coal produced and CO2 emitted per EIA) — a reduction of 45%! For details read Coal bankruptcies point to a better future for our climate. The second is also already happening. Volvo plans to make only hybrid or all-electric cars by 2019. Toyota plans to sell a car in 2022 powered by a solid state battery that significantly increases driving range and reduces charging time. Norway plans to allow sale only of electric cars after 2025. India is aiming for 2030. Britain will ban sales of gas and diesel cars after 2040. As will France. These are just first movers in this race. Looking further out, a host of radical new batteries are under development. For example, U Texas-Austin engineers led by Professor John Goodenough, co-inventor of the lithium-ion battery, have developed the first all-solid-state battery cells that could lead to safer, faster-charging, longer-lasting rechargeable batteries (see their press release and their paper in Energy & Environmental Science, Jan 2017). Animation of their previous machine at work, the C-2U. Is this unrealistic? No. We need only continue current trends. Energy efficiency has been improving for decades, as shown in this graph from “Reaching peak emissions” by Robert B. Jackson, Nature Climate Change, January 2016 (also see energy efficiency by nation from the World Bank). New technologies, such as cheaper and better batteries, can take this trend to levels we can only imagine today. Progress has been fastest in the developed nations. For example, one form of energy intensity — electricity use/GDP — has been declining in the US since 1976. Per capita electricity consumption has been declining in the US since 1999. See this April 2017 Bloomberg article for details (e.g., “most other developed countries have experienced a plateauing or decline in electricity use similar to that in the U.S. over the past decade.”). The results are already visible — except in the mainstream news. Growth in CO2 emissions was strong during the China-driven boom years of 2000-09, but has been slowing during the past five years. Emissions were flat in 2014-15, and are estimated to have grown only slightly in 2016. This graph is from”Global Carbon Budget 2016” by Corinne Le Quéré et al in Earth System Science Data, 14 November 2016. Click to enlarge. Here are predictions of humanity’s CO2 emissions in three RCP scenarios, at decade intervals. Green is RCP2.6, blue is RCP4.5, and red is RCP6.0. RCP8.5 is off this scale. In RCP2.6 CO2 emissions steeply fall in the 2020s. Graph is from the interactive tool at the RCP Database. What about levels of greenhouse gasses (GHG)? 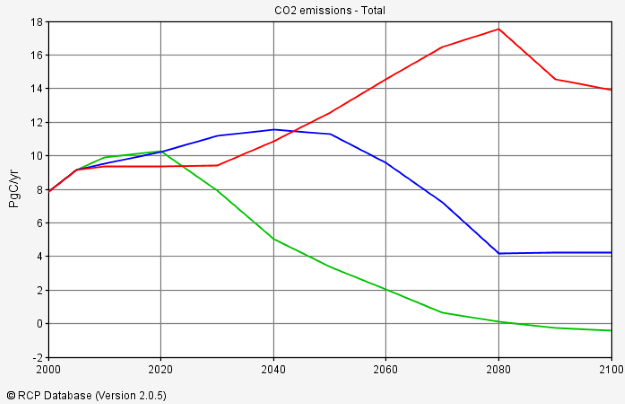 This shows the total expressed as equivalent of CO2 (in parts per million). For reasons discussed above, they only decline — and slowly — starting in the 2040s. By 2100 the level is … It does not matter. That is far beyond what we can reliably predict now, any more than the people of 1934 could predict our world of today. What happens to global atmosphere and ocean temperatures in the world of RCP2.6? Estimates vary. The rise is probably close to 2 degrees Centigrade over pre-industrial levels, a long-standing goal for limiting anthropogenic climate change. The answer can be seen from readers’ reaction to the 4,000+ posts on the FM website. “If it bleeds, it leads.” People want to read scary stories. They want to read exciting stories cheering our side’s angelic warriors — and hissing at our foes, satan’s minions. Good news does not get big traffic. We love scary stories. The reason why reveals a secret about America. I have a major issue with the CAGW meme. I want to know what justification there is for any climate policy? The justification has to be on the basis of the net global impacts of climate change, not of climate change itself. The justification for the presumption that 2C warming would be dangerous is virtually non-existent – even IPCC AR5 says so in WG3 Chapter 3. I pay no attention to WGII and WGIII, personally. But “dangerous” is imo not a useful framing. There would be impacts, some quite large. There are a lot of papers about the effects of a two degree rise over pre-industrial. But you have the missed the point of this post. Two degrees is not catastrophic. Two degrees via RCP2.6 is an alternative to far larger warming — which would certainly have very large unpleasant effects. We’ve spent 30+ years arguing about the science – i.e. WG1. It’s getting us nowhere. And WG1 is not what justifies expenditures on climate policies. WG3 is needed for that. But there is no valid justification in WG3 – search for ‘damage function’ in Chapter 3. 1. They are mostly not complete and not balanced in that they do not provide a fair assessment of the total benefit or damage of global warming. My point is that there is no valid evidence to show that the net impact of global warming would be negative. In fact, it seems to me, Tol (2013) https://link.springer.com/article/10.1007%2Fs10584-012-0613-3#page-1 (Figure 3) shows the net economic impact of all impact sectors except energy are positive up to about 4C warming. Empirical evidence seems to suggest the FUND projection of energy from 2000 to 2100 is incorrect – should be positive economic impact, not negative. In which case, if the projection of the other sectors are correct, the impact of global warming would be beneficial to >4C. It seems to me 2C is more likely to be beneficial than damaging. We need to change the priority from studying science to studying the impacts. I am always amazed at people who so lightly brush away the work of thousands of scientists, conducted over generations. I’ve seen this repeatedly in the 4,000+ comments on the FM website — regards many fields. Experience has taught me not to bother responding, since these people are immune to logic and facts. Thanks for your conversation. Please go to a website with people capable of and interested in discussing basic science. Good bye. Please explain why it is not legitimate to ask if carbon dioxide emissions from burning fossil fuels are the PRINCIPAL cause of of global warming since 1970. I just realized that my question might make you think I’m a denier. I’m not. I just want to know what to say to deniers. This website is to discuss geopolitics. I don’t give lessons in basic science. There are hundreds of explanations of the “greenhouse effect” — by major experts — on the web. Anyone who sincerely wants to learn can easily find them. For example, Wikipedia gives a good explanation, with links to reliable sources (its big value is in the links). I’ve spent time on hundreds of such discussion, learning that the question is a major “troll alert.” Trolls are a pox on the web, to be dealt with promptly and firmly. See how major website operators deal with this. I will not be able to use your reply. It says nothing about the PRINCIPAL issue. If the extensive explanations of the IPCC. NOAA, and others won’t convince you, then you are a hard-core science denier. Join the creationist, astrologers, and flat-earthers. Please don’t be offended if you are treated like them. 1. Would someone please get that FM troll off the page? 2. The “settled science” of global warming has three components. First the Greenhouse Effect, normally abbreviated as GHE. This is settled science, but it is the only scientific part of the narrative. Second there are predictions, based on climate models. Because these predictions do not match reality, many skeptics would call the models a dismal failure, but I disagree. The models have been most successful in proving that humans and CO2 have very little influence on climate. Third, there is attribution of recent warming to humans. Although this warming appears to have been somewhat exaggerated, most skeptics agree that there has been warming. But to attribute the warming to humans, we would need a baseline of what planetary temperatures would have been without human activities, and this is impossible. You could try to calculate this baseline, but then you would be using the same climate models that have made such erroneous predictions. Components Two and Three are thus just speculation, wishful thinking or what some might call propaganda. I’m the Editor here. I can kick you off. You can’t kick me off. If you’re unhappy, go away. (2) You quite confidently say that most climate scientists are wrong. I assume you do this on the basis of your proven expertise in the relevant fields of science. Can we see evidence of this? After 30 years of this, I think most of us have grown weary of people speaking as if they were the Pope of Science. In this, as in so many things, activists and skeptics often sound alike.